Se-tenant block - two or more stamps, joined vertically or horizontally, differing in value or design. Our stamps are supplied in a robust glassine bag. You may decide to place the stamps in a specia.. 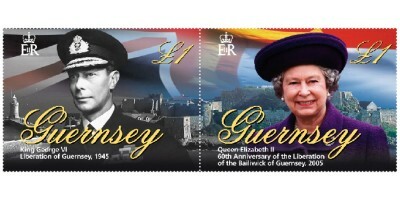 This definitive se-tenant pair featuring King George VI and HM The Queen Elizabeth II commemorates the Liberation of the Bailiwick of Guernsey from enemy occupation on 9 May 1945. Ever since the people of Guernsey swore their allegiance to the English Crown in 1204, the Bailiwick has enjoyed a strong and lasting relationship with the Monarchy. Royal visits have always been eagerly anticipated and one that was received with joy and enthusiasm was that of King Geoorge VI and Queen Elizabeth on 7 June 1945. The inseparable bond between the English Crown and Guernsey is represented in our stamps which replace the £1 Maritime Definitive.